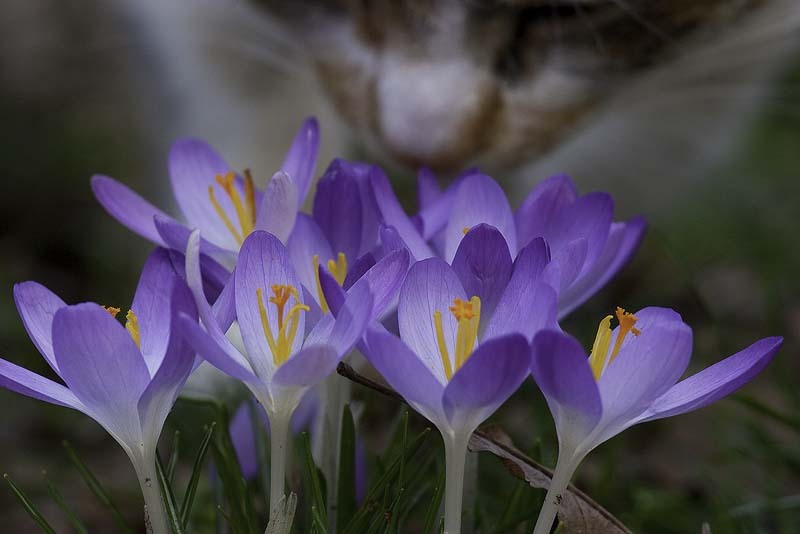 These tiny crocus rise up in early spring from underground bulbs most likely planted by mid-century inhabitants. The cat walked into the last frame, putting their miniature size into perspective. I've just finished many deadlines on my day job and am back to the photoblog. A really unusual shot. Funny how accidents like this can be compelling. The sharpness of the flowers is really something. Wow! Incredibly vivid color and detail. Oooooh this is gorgeous AND then I noticed the cat nose. Wonderful! Thank you. Great color/detail on the anthers and stigma. I've come across cultivar bulbs on many of my hikes (like out at Pt Reyes) and often thought they might be from old homesteads. Thanks for the historical info along with the magnificent flower (for the life of me I don't see a cat let alone a cat's nose!). I was so busy checking out the flowers that I didn't even notice the cat at first, but that is a really great photo! Fantastic!! The flowers in themselves are enough..and then the on-looking cat. Purr-fect!!! Exquisite picture, too bad about the depth of field technicality. Better detail on the cat would have been great.